How does The ALL EVENTS PHOTO BOOTH work? You just walk in, grab some props, choose color or black and white or listen to the instruction provided by the reps, and/or follow the instructions on the 20 inch screen. Basically…. POSE! Are the photos black & white, or color? It’s up to you. Your guests have the option when they step into the booth. How much space do you need for set up? The ALL EVENTS PHOTO BOOTH is best suited for a 10’ x 10’ space, enough space for a table or two for props and an area for the album and comments. To be safe we recommend a space of 10′ by 10′ space but can fit into something smaller, but you may sacrifice quality or the amount of people we can fit in each shot. How many pictures can we take? As many as you like during your rental time! Your guests will tire out before we do! How much time do you need for set-up? We want access into the venue about an hour before the booked time. We really only need 30 minutes or less, but we like to leave space for trouble shooting if any problems arise. What do I need to know, and communicate to the venue? You need to inform them of the ALL EVENTS PHOTO BOOTH requirements, such as the 10′ by 10′ space required, its placement in the venue, a table and 2 chairs for the attendants and a matching table cover to ensure we look like the rest of your design. MOST IMPORTANTLY, A POWER SUPPLY/OUTLET! How does the open air booth work and whats the difference? This doesn’t come with the canopy. You receive the photo booth tower and the optional back drop. 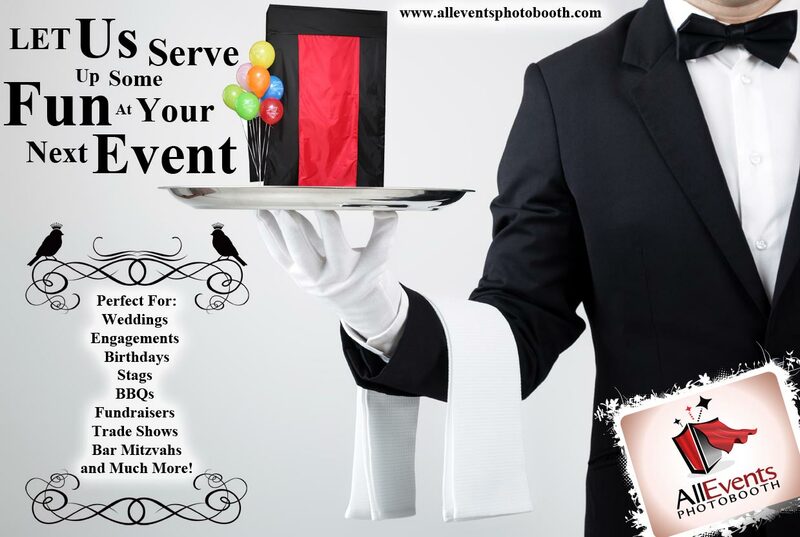 Instead of being in a 5′ by 5′ booth, its open giving your other guests the ability to join in on the fun. This is the most popular way to set-up. It is safer, cheaper, and a lot more fun! How many people can fit in a shot? As many as possible! How much space do you need for set up? This is up to you… the tower itself needs only a few feet, but the more room you give it, the more people can jump into the shots. 10′ by 10′ is best. Why would I choose an open air photo booth? The open air booth gives you all the fun of the canopy system minus the surrounding cover. It’s the preferred system for venues with limited space or if you wish to have a certain part of your event in the background. It’s also a quicker set-up if your planning to surprise your guests with this booth. This booth can save you some money if price is a issue. If you wish to have a custom printed back drop, this would be your route since we offer custom printed backgrounds for this set-up. This booth also allows the guests waiting in line to see the fun others are having, and may encourage them to join in on the fun. Why would I want a booth? I already have a photographer… 1) It’s an additional piece of entertainment that people of all ages will enjoy. 2) Each one of your guests will be able to have some fun on your special day, and receive a keep sake of their own to remember all the fun they had on your special day/event. 3) Photographers and videographers have a tendency to focus on the couple, the bridal party, close family or specific moments during your event. This is a way to ensure you get some shots of your guests to remember them by. Best part is, they’re all in costumes having a great time in these personalized photo shoots, something you can laugh about with them for years to come! What do most people think when they see a booth for the first time? Usually we get the, “what the hell is this?”, followed by the, “That’s so awesome, how much?”. That’s why there will be attendants on site to inform them on what it is, why its there, and how its free to them. At which point we get the, “ohhhh man, give me one second to get my friends”. Which of course, leads to plenty of fun being had! Can we choose the backdrop color for our photos? Sure! Choose from a number of different colours based on availability. Email us to learn more about a customized backdrop! Can we personalize our prints with a banner? Sure. As a complimentary service, we’ll work with you to design a cool banner with your names and event date. Let us know in advance the design of choice! Why would I want double prints? Double prints give you two instant 4×6 printouts of each photo. Your guests can take them home as mementos (consider giving out 4×6 picture frames as wedding favors!). We can also collect the extra copies in an album—and save them for you. What’s the scrapbook keepsake package? To make your take-home goodies a little more special, the “scrapbook keepsake” package contains everything it takes for your guests to create a custom-designed scrapbook album—just for you. It includes a customized scrapbook backdrop (themes and colors), a double set of prints (one for the guest, one for your scrapbook) and a scrapbook station with supplies (paper, good markers, stickers, scissors, double-sided tape) for your guests to add their photos and comments. Brides love scrapbooks as a fun alternative to conventional guestbooks! What area do you serve? GTA and surrounding areas. We are based in Kleinburg in Vaughan. We have done events as far as Niagara falls, to Collingwood, to Pickering. How early do I need to reserve a Photo Booth? We book just one event per day per equipment… so the earlier you book, the better! Email us your dates to learn more! I’m ready to reserve! What should I do? Call us at 416-829-9628, or fill out the form on the Contact Us page to confirm availability. If your date is still available, we’ll email you a rental agreement, along with deposit instructions. How much is the deposit? A $500 non-refundable deposit reserves your date exclusively. Do you offer any other services? Of course we do. We are a part of a media production house. We have multiple other services including photography, graphic design, print, promotional items and an assortment of different video products. Ask a sales representative for these other unique services, the discount we can provide for bundling up these services and for any more information as our business is always changing.